We have a standing date the first Saturday of each month to share dinner and a walk-about on Tucson’s “First Saturday Art Walk” where pop into shops and galleries after sharing a meal at cool local cafes. We have a monthly Movie Mavens matinee date to see and discuss movies. We have “Book Worms” a readers & writers circle for sharing books and lively discussions about them. We attend the Tucson Festival of Books and various “meet the authors” readings at Antigone and other literary spots around town. We go to plays, attend concerts, and enjoy interesting community events together. We march, peacefully protest, work for social justice, and are always ready to stand up and be counted. 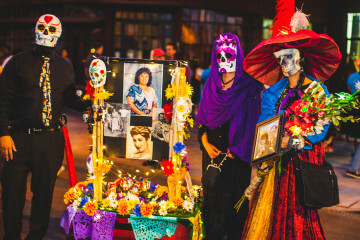 Each year we attend Tucson’s famous Day of The Dead Parade and activities. Please come join the fun! Check this page as we schedule our future adventures and do sign up to receive this blog automatically by “following” it –on the home page–scroll down on the right side and you’ll see a place to add your email address. Here are some past Chix adventures! Exploring the world of mosaics and stained glass at Tucson Stained Glass. Judy, our delightful instructor (in the peach colored top in the center of the photo) was such fun and we had a blast!!! Check out these fabulous totems! You don’t want to miss out! CREATIVITY CHIX ROCKS!!!! Check out the Tucson Stained Glass web site at http://www.tucsonstainedglass.com. Marnie has work represented at this fabulous gallery and we had a great time browsing the beautiful space… with so many unique bits of art from the most talented local Tucson artists! What fun to have time to look closely at beautiful things in such a congenial space… Two other of the Creativity Chix had their work represented at the gallery too…Doty and Sharon… It was loads of fun to admire the unique offers including these favorites of mine… and it was fun to talk with staff and laugh and enjoy this wonderful artist date together! To end a perfect day, we had a fabulous lunch together at Cafe A La C’Art by the Tucson Museum of Art! It was such a fun day–aren’t you sorry you missed it!! Watch this page for new fun play dates!